Here at UK Poker News we recently reviewed the exciting Littlewoods Poker room. Littlewoods, who are synonymous with gaming in the UK, have launched a very appealing live poker promotion. 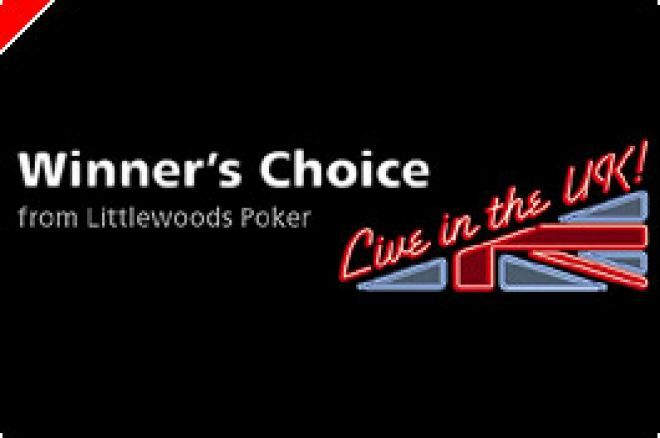 'Winner's Choice' offers Littlewoods Poker players the chance to play in the best live poker events the UK has to offer. You don't have to worry about getting to these events either. Littlewoods will give all qualifying players an extra £200 towards travel and accomodation expenses. If you've always fancied playing in the big live games in the UK, then this is the promotion for you. With buy-ins and expenses taken care of there is no excuse for sitting behind your PC any longer. Unless, of course, you're ripping up the tables on Littlewoods Poker! So, where can you play via this promo? Events include: the Grosvenor UK Poker Tour (GUKPT), the Gala British Poker Tour and a whole host of £1000 buy-in events across the nation. The GUKPT is taking the UK poker circuit by storm. The tour consists of eleven major poker tournaments taking place as a main event at an existing Grosvenor poker festival. Each event will be televised and broadcast in the 3rd and 4th quarters of 2007 on Channel 4. Make the final of a GUKPT event and you'll be taking away some fame alongside a small fortune! Okay, so you want to qualify for a Winner's Choice event. There are lots of ways to claim your seat and qualifiers are available to suit every budget. Daily Thunder sub-satellites start every day at 6.45pm and 7.45pm. With a buy-in of £3+£0.30 you'll only need to dig around the back of the sofa to buy-in for this one. The Daily Thunder sub-sats send qualifiers for the bigger daily satellites. These great value £15+£1.50 qualifiers send players to the super satellite weekly final. Played every Wednesday at 8.45pm, this super satellite has a direct buy-in of £70+£7. 1 Winner's Choice prize is on offer for every 15 players and 1 prize is guaranteed in every event. This is your chance to experience the excitement of the live poker circuit. Join the big names as the battle it out for the big prizes. All from £3+£0.30. Win a Caribbean Poker Cruise with UK Poker News! Introducing the Great Everest Poker $12,000 WSOP Freeroll!